Containing over 200 articles from prominent scholars, The Encyclopedia of Politics and Religion examines ways in which politics and religion have combined to affect social attitudes, spark collective action and influence policy over the last two hundred years. With a focus that covers broad themes like millenarian movements and pluralism, and a scope that takes in religious and political systems throughout the world, the Encyclopedia is essential for its contemporary as well as historical coverage. 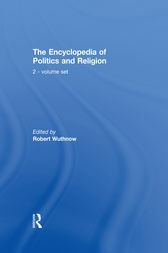 The Encyclopedia of Politics and Religion will be invaluable for any library, public and academic, which serves those interested in politics, sociology, religious studies, international affairs and history.